Education in the Philippines is provided by public and private schools, colleges, universities, and technical and vocational institutions in the country. Funding for public education comes from the national government. For the academic year 2017–2018, about 83% of K–12 students attended public schools and about 17% either attended private schools or were home-schooled. With the "trifocalization" of the educational system in the country, three government agencies handle each level of education. At the basic education level, the Department of Education (DepEd) sets overall educational standards and mandates standardized tests for the K–12 basic education system, although private schools are generally free to determine their own curriculum in accordance with existing laws and Department regulations. On the other hand, at the higher education level, the Commission on Higher Education (CHED) supervises and regulates colleges and universities. Meanwhile, the Technical Education and Skills Development Authority (TESDA) regulates and accredits technical and vocational education programs and institutions in the country. By law, education is compulsory for thirteen years (kindergarten and grades 1–12) and is grouped into three levels: elementary school (kindergarten–grade 6), junior high school (grades 7–10), and senior high school (grades 11–12). They may also be grouped into four key stages: 1st key stage (kindergarten–grade 3), 2nd key stage (grades 4–6), 3rd key stage (grades 7–10) and 4th key stage (grades 11–12). Children could enter kindergarten at age 5. Institutions of higher education may be classified as either public or private college or university, and public institutions of higher education may further be subdivided into two types: state universities and colleges and local colleges and universities. During the pre-colonial period, most children were provided with solely vocational training, which was supervised by parents, tribal tutors or those assigned for specific, specialized roles within their communities (for example, the baybayin). In most communities, stories, songs, poetry, dances, medicinal practices and advice regarding all sorts of community life issues were passed from generation to generation mostly through oral tradition. 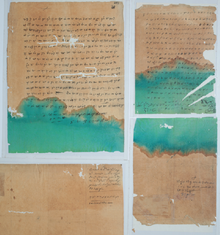 Some communities utilized a writing system known as baybayin, whose use was wide and varied, though there are other syllabaries used throughout the archipelago. Formal education was brought to the Philippines by the Spaniards, which was conducted mostly by religious orders. Upon learning the local languages and writing systems, they began teaching Christianity, the Spanish language, and Spanish culture. These religious orders opened the first schools and universities as early as the 16th century. Spanish missionaries established schools immediately after reaching the islands. The Augustinians opened a parochial school in Cebu in 1565. 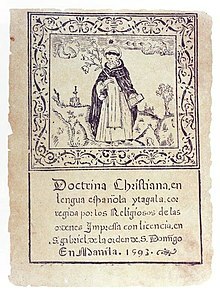 The Franciscans, took to the task of improving literacy in 1577, aside from the teaching of new industrial and agricultural techniques. The Jesuits followed in 1581, as well as the Dominicans in 1587, setting up a school in Bataan. The church and the school cooperated to ensure that Christian villages had schools for students to attend. Schools for boys and for girls were then opened. Colegios were opened for boys, ostensibly the equivalent to present day senior high schools. The Universidad de San Ignacio, founded in Manila by the Jesuits in 1589 was the first colegio. Eventually, it was incorporated into the University of Santo Tomas, College of Medicine and Pharmacology following the suppression of the Jesuits. Girls had two types of schools - the beaterio, a school meant to prepare them for the convent, and another, meant to prepare them for secular womanhood. The Educational Decree of 1863 provided a free public education system in the Philippines, managed by the government. The decree mandated the establishment of at least one primary school for boys and one for girls in each town under the responsibility of the municipal government, and the establishment of a normal school for male teachers under the supervision of the Jesuits. Primary education was also declared free and available to every Filipino, regardless of race or social class. Contrary to what the propaganda of the Spanish–American War tried to depict, they were not religious schools; rather, they are schools that were established, supported, and maintained by the Spanish government. After the implementation of the decree, the number of schools and students increased steadily. In 1866, the total population of the Philippines was 4,411,261. The total number of public schools for boys was 841, and the number of public schools for girls was 833. The total number of children attending those schools was 135,098 for boys, and 95,260 for girls. In 1892, the number of schools had increased to 2,137, of which 1,087 were for boys, and 1,050 for girls. By 1898, enrollment in schools at all levels exceeded 200,000 students. Among those who benefited from the free public education system were a burgeoning group of Filipino intellectuals: the Ilustrados ('enlightened ones'), some of whom included José Rizal, Graciano López Jaena, Marcelo H. del Pilar, Mariano Ponce, and Antonio Luna—all of whom played vital roles in the Propaganda Movement that ultimately inspired the founding of the Katipunan. Some schools established during this period were founded by non-Spaniards, and were therefore not colonial creations. Damian Domingo, a Chinese mestizo, established in 1823 a fine arts school known as the Academia de Dibujo y Pintura, which is now the Fine Arts College of the University of the Philippines. In 1868, Doña Margarita Roxas de Ayala, also of Chinese mestizo ancestry, established the girls' school La Concordia. The defeat of Spain following the Spanish–American War led to the short-lived Philippine Independence movement, which established the insurgent First Philippine Republic. The schools maintained by Spain for more than three centuries were closed briefly, but were reopened on August 29, 1898 by the Secretary of Interior. The Burgos Institute (the country's first law school), the Academia Militar (the country's first military academy), and the Literary University of the Philippines were established. Article 23 of the Malolos Constitution mandated that public education would be free and obligatory in all schools of the nation under the First Philippine Republic. However, the Philippine–American War hindered its progress. Although established in the American-occupied zone, National University is a Philippine college which dates from this period which has survived to the present. There also existed for many decades the Rosa Sevilla Memorial School, which was originally founded as the Instituto de Mujeres on 15 July 1900. About a year after having secured Manila, the Americans were keen to open up seven schools with army servicemen teaching with army command-selected books and supplies. In the same year, 1899, more schools were opened, this time, with 24 English-language teachers and 4500 students.In that system, basic education consisted of 6 years elementary and 4 years secondary schooling which, until recently, prepared students for tertiary level instruction for them to earn a degree that would secure them a job later on in life. A highly centralized, experimental public school system was installed in 1901 by the Philippine Commission and legislated by Act No. 74. The law exposed a severe shortage of qualified teachers, brought about by large enrollment numbers in schools. As a result, the Philippine Commission authorized the Secretary of Public Instruction to bring more than 1,000 teachers from the United States, who were called the Thomasites, to the Philippines between 1901 and 1902. These teachers were scattered throughout the islands to establish barangay schools. The same law established the Philippine Normal School (now the Philippine Normal University) to train aspiring Filipino teachers.The high school system was supported by provincial governments and included special educational institutions, schools of arts and trades, an agricultural school, and commerce and marine institutes, which were established in 1902 by the Philippine Commission. Several other laws were passed throughout the period. In 1902, Act No. 372 authorized the opening of provincial high schools. while in 1908, Act No. 1870 initiated the opening of the University of the Philippines, now the country's national university. The emergence of high school education in the Philippines, however, did not occur until 1910. It was borne out of rising numbers in enrollment, widespread economic depression, and a growing demand by big businesses and technological advances in factories and the emergence of electrification for skilled workers. In order to meet this new job demand, high schools were created and the curriculum focused on practical job skills that would better prepare students for professional white collar or skilled blue collar work. This proved to be beneficial for both the employer and the employee; the investment in human capital caused employees to become more efficient, which lowered costs for the employer, and skilled employees received a higher wage than those employees with just primary educational attainment. However, a steady increase in enrollment in schools appeared to have hindered any revisions to then-implemented experimental educational system. Act No. 1381, also known as Gabaldon Law, was passed in 1907, which provided a fund of a million pesos for construction of concrete school buildings and is one of many attempts by the government to meet this demand. In line as well with the Filipinization policy of the government, the Reorganization Act of 1916 provided that all department secretaries except the Secretary of Public Instruction must be a natural-born Filipino. A series of revisions (in terms of content, length, and focus) to the curriculum began in 1924, the year the Monroe Survey Commission released its findings. After having convened in the period from 1906 to 1918, what was simply an advisory committee on textbooks was officiated in 1921 as the Board on Textbooks through Act No. 2957. The Board was faced with difficulties, however, even up to the 1940s, but because financial problems hindered the possibility of newer adaptations of books. The Japanese Military Administration's Order No.2 of 17 February 1942 had six basic points: the propagation of Filipino culture; the dissemination of the principle of the Greater East Asia Co-Prosperity Sphere; the spiritual rejuvenation of the Filipinos; the teaching and propagation of Nippongo; the diffusion of vocational and elementary education; and the promotion of love of labor. After having been closed following the outbreak of the Pacific War, elementary schools followed by vocational and normal schools, reopened. Colleges offering courses in agriculture, medicine, fisheries, and engineering also resumed teaching, however law courses were not instructed. Educational reforms required teachers to obtain licenses following rigid examinations. All heads of educational institutions were also required to obtain licenses. Also, the teaching of Tagalog. Philippine History, and character education were reserved for Filipinos. The Japanese created the following educational institutions: the Training Institute, for former USAFFE soldiers; the Normal Institute; the Preparatory Institute of Government Scholars to Japan; the Government Employees Training Institute; the New Philippines Cultural Institute; Constabulary Academy No. 1, at the Mapa High School Building in Bagumpanahon; Constabulary Academy No. 2, at the former Araullo High School Building in Bagumbayan; Constabulary Academy No. 3 at the Torres High School Building in Bagumbuhay; and Constabulary Academy No. 4 at the Legarda Elementary School in Bagumpanahon. During this period the Philippine Nautical School, now known as the Philippine Merchant Marine Academy, remained in operation and its student population was even increased by the Japanese authorities. A school established during the Japanese period which still exists is St. Paul College of Makati. The education sector of the country had undergone several changes throughout the years after the relinquishment of the United States of its authority all over the Philippines in 1947. Then President Manuel Roxas issued Executive Order No. 94 which renamed Department of Instruction into Department of Education with the regulation and supervision of public and private schools belonging to the Bureau of Public and Private Schools. Under the Marcos administration, the Department of Education became the Department of Education and Culture and consequently Ministry of Education and Culture according to Presidential Decree No. 1 and Presidential Decree No. 1397. The Education Act of 1982 provided for an integrated system of education covering both formal and non-formal education at all levels. Section 29 of the act sought to upgrade educational institutions' standards to achieve "quality education" through voluntary accreditation for schools, colleges, and universities. Section 16 and Section 17 upgraded the obligations and qualifications required for teachers and administrators. Section 41 provided for government financial assistance to private schools. After the ratification of the 1987 constitution, the fundamental aims of education in the Philippines were defined and most importantly, elementary schooling was made compulsory for all children. Meanwhile, the enactment of the Free Public Secondary Education Act of 1988 or Republic Act 6655, mandated free public secondary education commencing in the school year 1988–1989. In 1987, the Ministry of Education, Culture and Sports again became the Department of Education, Culture, and Sports under Executive Order No. 117 and remained practically unchanged until 1994. According to the 1991 report by the Congressional Commission on Education (EDCOM), the department was recommended to be divided into three parts. Thus, the passage of the Republic Acts 7722 and 7796 in 1994 led the "trifocalization" of the educational system in the Philippines. Republic Act 7722 or the Higher Education Act of 1994 created the Commission on Higher Education (CHED), which assumed the functions of the Bureau of Higher Education and supervised tertiary degree programs Republic Act 7796 or the Technical Education and Skills Development Act of 1994, created the Technical Education and Skills Development Authority (TESDA), which absorbed the Bureau of Technical-Vocational Education as well as the National Manpower and Youth Council, and began to supervise non-degree technical-vocational programs. Meanwhile, the Department of Education, Culture, and Sports retained responsibility for all elementary and secondary education. The start of the twenty-first century saw a major change in the Philippine education system. In August 2001, Republic Act 9155, otherwise called the Governance of Basic Education Act, was passed. This act changed the name of department to the current Department of Education (DepEd) and redefined the role of field offices (regional offices, division offices, district offices and schools). The act provided the overall framework for school empowerment by strengthening the leadership roles of headmasters and fostering transparency and local accountability for school administrations. The goal of basic education was to provide the school age population and young adults with skills, knowledge, and values to become caring, self-reliant, productive, and patriotic citizens. In 2005, the Philippines spent about US$138 per pupil, compared to US$3,728 in Japan, US$1,582 in Singapore and US$852 in Thailand. In January 2009, the Department of Education signed a memorandum of agreement with the United States Agency for International Development (USAID) to seal $86 million assistance to Philippine education, particularly the access to quality education in the Autonomous Region in Muslim Mindanao (ARMM), and the Western and Central Mindanao regions. In 2010, then-Senator Benigno Aquino III expressed his desire to implement the K–12 basic education cycle to increase the number of years of compulsory education to thirteen years. According to him, this will "give everyone an equal chance to succeed" and "have quality education and profitable jobs". After further consultations and studies, the government under President Aquino formally adopted the K–6–4–2 basic education system—one year of kindergarten, six years of elementary education, four years of junior high school education and two years of senior high school education. Kindergarten was formally made compulsory by virtue of the Kindergarten Education Act of 2012, while the further twelve years were officially put into law by virtue of the Enhanced Basic Education Act of 2013. Although DepEd has already implemented the K–12 Program since SY 2011–2012, it was still enacted into law to guarantee its continuity in the succeeding years. In 2017, the Universal Access to Quality Tertiary Education Act was promulgated mandating the government through all state universities and colleges (SUCs) to provide free tertiary education for all Filipino citizens. The mandate does not include private schools. However, certain subsidies for students enrolled in private higher education institutions are available. Formal education is the hierarchically structured, chronologically graded 'education system', running from primary school through the university and including, in addition to general academic studies, a variety of specialized programs and institutions for full-time technical and professional training. K-12 and tertiary education from colleges are characterized as formal education. This does not include the informal education in the Philippines learned from daily experience and the educative influences and resources in his or her environment. Nor does this include non-formal education like the alternative learning systems provided by the Department of Education (DepEd), Technical Education and Skills Development Authority (TESDA) and other programs from educational institutions. K-12 is a program that covers kindergarten and 12 years of basic education to provide sufficient time for mastery of concepts and skills, develop lifelong learners, and prepare graduates for tertiary education, middle-level skills development, employment, and entrepreneurship. The 12 years of compulsory education in the Philippines is divided into Kindergarten, Primary Education, Junior High School, Senior High School. (6) Nurturing the Holistically Developed Filipino (College and Livelihood Readiness, 21st Century Skills) so that every graduate to be equipped with information, media and technology skills; learning and innovation skills; effective communication skills; and life and career skills. Senior High School, an important feature of the new K-12 program, creates several opportunities. Standard requirements will be applied to make sure graduates know enough to be hirable. Senior High School students will now be able to apply for TESDA Certificates of Competency (COCs) and National Certificates (NCs) to provide them with better work opportunities. Partnerships with different companies will be offered for technical and vocational courses. Senior High School students can also get work experience while studying. Aside from these, entrepreneurship courses will now be included. Instead of being employed, one can choose to start his or her own business after graduating, or choose to further one's education by going to college. Senior High School, as part of the K to 12 Basic Curriculum, was developed in line with the curriculum of the Commission of Higher Education (CHED) – the governing body for college and university education in the Philippines. This ensures that by the time one graduates from Senior High School, one will have the standard knowledge, skills, and competencies needed to go to college. Because of the shift of the curriculum in K-12, the College General Education curriculum will have fewer units. Subjects that have been taken up in Basic Education will be removed from the College General Education curriculum. Details of the new GE Curriculum may be found in CHED Memorandum Order No. 20, series of 2013. Regarding teachers, there are common misconceptions that teachers will lose their jobs because of the shift to the K-12. However, DepEd ensures that "no high school teachers will be displaced." The Department of Education (DepEd) is in constant coordination with CHED and DOLE on the actual number of affected faculty from private higher education institutions (HEIs). The worst-case scenario is that 39,000 HEI faculty will lose their jobs over 5 years. This will only happen if none of the HEIs will put up their own Senior High Schools; however, DepEd is currently processing over 1,000 Senior High School applications from private institutions. DepEd is also hiring more than 30,000 new teachers in 2016 alone. The Department will prioritize affected faculty who will apply as teachers or administrators in Senior High Schools. In kindergarten, the pupils are mandated to learn the alphabet, numbers, shapes and colours through games, songs, pictures and dances, but in their native language; thus after Grade 1, every student can read on his/her native tongue. The 12 original mother tongue languages that have been introduced for the 2012–2013 school year are Bicolano, Cebuano, Chavacano, Hiligaynon, Ilocano, Kapampangan, Maguindanaoan, Maranao, Pangasinense, Tagalog, Tausug and Waray-Waray. 7 more mother tongue languages have been introduced for the 2013–2014 school year. These are Aklanon, Ibanag, Ivatan, Kinaray-a, Sambal, Surigaonon and Yakan. A common poem read in Filipino kindergartens is Ang aking alaga (My pet); a common song, Ako ay may lobo (I have a balloon). The Science and Mathematics subjects are now modified to use the spiral progression approach starting as early as Grade 1 which means that every lesson will be taught in every grade level starting with the basic concepts to the more complex concepts of that same lesson until Grade 10. Core curriculum learning areas include languages, literature, communication, mathematics, philosophy, natural sciences and social sciences. Accountancy, Business & Management (ABM) - for those interested in pursuing college or university education in fields of accountancy, business management, business administration, office management, economics, or entrepreneurship. Humanities & Social Sciences (HUMSS) - for those interested in pursuing college or university education in fields of languages, mass communication and journalism, literature, philosophy, history, education, liberal arts, and the rest of humanities and social sciences. Science, Technology, Engineering & Mathematics (STEM)- for those interested in pursuing college or university education in fields of basic and applied sciences, biological sciences, physical sciences, laboratory sciences, nutrition and allied medicine, mathematics, and engineering. General Academic Strand (GAS) - for those interested in pursuing college or university education but are not sure of what field to pursue as a career. Home Economics like tourism, culinary art, cosmetology, clothing, handicraft, housekeeping, etc. Industrial Arts like automotive services, carpentry and construction, masonry, plumbing, machining, electricity and electronics, etc. Agricultural and Fishery Arts like agriculture, animal production, horticulture, food processing, aquaculture, fish capture, landscaping, etc. Information and Communications Technology like animation, illustration, technical drafting, medical transcription, programming, and computer services. Arts and Design, which is helping interested senior high school students in the particular fields of journalism, broadcast art,and mass media; media and entertainment; creative writing like poetry, fiction writing, and playwriting; studio arts like drawing, painting, sculpture, and printmaking, media arts like animation,photography, graphic design, illustration, layout design, digital painting, music production, sound design, game design, application design, film and videography; applied arts or decorative arts like fashion design, industrial design, product and packaging design, jewelry design, clothing and accessories, set and costume design, and ceramics; dance like folk dance, classical and modern ballet, ballroom and Latin dances, hip-hop, contemporary and popular dances, and choreography; theater arts like acting, theater design, technical theater, and directing; and music like instrumental music, vocal music, ensemble and chamber music, and composition and music production. Art forms offered especially in visual and media arts depends on schools' capacity, faculty, resident artists and designers in immediate or local community, equipments and resources. Sports, which is responsible for educating senior high school students in the fields of sports, physical education, fitness, and health. With pursued professions such as sports athlete, sports coach, fitness coach, sports officiator, sports activity or event manager, sports tournament manager, fitness leader and expert, fitness instructor, gym instructor, sports expert, recreation leader and expert, physical and massage therapist, physical education instructor, physical education and health instructor, MAPEH instructor, and sports scientist. K-12's implementation began in 2011 when kindergarten was rolled out nationwide. It continued by fully implementing the system for Grades 1 and 7 during the school year 2012-2013, for grade 11 during 2016, and for grade 12 during 2017. Phase II: Modeling and Migration. Its goal is to promote the enactment of the basic education law, to finally start of the phased implementation of the new curriculum for Grades 1 to 10, and for the modeling of the senior high school. In terms of preparing the resources, specifically classrooms, teacher items, textbooks, seats, and water and sanitation improvements, the following table shows the accomplished material from 2010 to 2014 and those planned for 2015. Private schools craft their transition plans based on: (1) current/previous entry ages for Grade 1 and final year of Kinder, (2) duration of program, and most importantly, (3) content of curriculum offered. The Department of Education's justifications in this change, in implementing 13 years of basic education, is that the Philippines is the last country in Asia and one of only three countries worldwide with a 10-year pre-university cycle (Angola and Djibouti are the other two), and that the 13-year program is found to be the best period for learning under basic education. It is also the recognized standard for students and professionals globally. 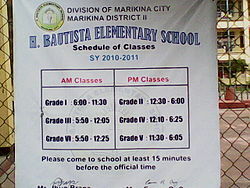 Elementary school, sometimes called primary school or grade school (Filipino: paaralang elementarya, sometimes mababang paaralan), is the first part of the educational system, and it includes the first six years of compulsory education (Grades 1–6) after compulsory pre-school education called Kindergarten. In public schools, the core/major subjects that were introduced starting in Grade 1 include Mathematics, Filipino, and Araling Panlipunan (this subject is synonymous to Social Studies).English is only introduced after the second semester of Grade 1. Science is only introduced starting Grade 3. Other major subjects then include Music, Arts, Physical Education, and Health (abbreviated as MAPEH), TLE (Technology and Livelihood Education) for Grade 6, EPP (Edukasyong Pantahanan at Pangkabuhayan) for Grades 4 and 5, Mother Tongue (Grades 1-3) and Edukasyon sa Pagpapakatao (synonymous to Ethics, Values or Character Education). In private schools, subjects in public schools are also included with the additional subjects including:Computer Education as a separate subject, though it is included in EPP and TLE through its ICT component. In Christian and Catholic schools, Religious Education is also part of the curriculum like Christian Values and Ethics, Christian Living, or Bible Studies. Islamic schools like Madrasa schools have a separate subjects for Arabic Language and for Islamic Values or abbreviated as ALIVE. Chinese schools may also have subjects in Chinese Language and Culture. International schools also have their own subjects in their own language and culture. 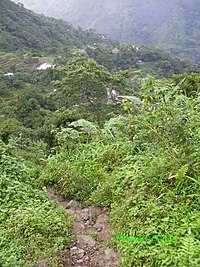 Only access from roadside (mid centre) to Upper Uma Elementary School Kalinga (behind) is via this one-hour mud climb. Viewed December 2008. From Kindergarten-Grade 3, students will be taught using their mother tongue, meaning the regional languages of the Philippines will be used in some subjects (except Filipino and English) as a medium of instruction. Aside from being incorporated as a language of instruction, it is also a separate subject for Grades 1-3. But from Grade 4, Filipino and English as a medium of instruction will then be used. In December 2007, the Philippine president Gloria Macapagal Arroyo announced that Spanish is to make a return as a mandatory subject in all Filipino schools starting in 2008, but this didn't come into effect. DepEd Bilingual Policy is for the medium of instruction to be Filipino for: Filipino, Araling Panlipunan, Edukasyong Pangkatawan, Kalusugan at Musika; and English for: English, Science and Technology, Home Economics and Livelihood Education. Article XIV, Section 7 of the 1987 Philippine constitution mandates that regional languages are the auxiliary official languages in the regions and shall serve as auxiliary media of instruction therein. As a result, the language actually used in teaching is often a polyglot of Filipino and English with the regional language as the foundation, or rarely the local language. Filipino is based on Tagalog, so in Tagalog areas (including Manila), Filipino is the foundational language used. International English language schools use English as the foundational language. Chinese schools add two language subjects, such as Min Nan Chinese and Mandarin Chinese and may use English or Chinese as the foundational language. The constitution mandates that Spanish and Arabic shall be promoted on a voluntary and optional basis. Following on this, a few private schools mainly catering to the elite include Spanish in their curriculum. Arabic is taught in Islamic schools. In July 2009, the Department of Education moved to overcome the foreign language issue by ordering all elementary schools to move towards initial mother-tongue based instruction (grades 1–3). The order allows two alternative three-year bridging plans. Depending on the bridging plan adopted, the Filipino and English languages are to be phased in as the language of instruction for other subjects beginning in the third and fourth grades. Though elementary schooling is compulsory, as of 2010[update] it was reported that 27.82% of Filipino elementary-aged children either never attend or never complete elementary schooling, usually due to the absence of any school in their area, education being offered in a language that is foreign to them, or financial distress. Secondary school in the Philippines, more commonly known as "high school" (Filipino: paaralang sekundarya, sometimes mataas na paaralan), consists of 4 lower levels and 2 upper levels. It formerly consisted of only four levels with each level partially compartmentalized, focusing on a particular theme or content. Because of the K-12 curriculum, the high school system now has six years divided into 2 parts. The lower exploratory high school system is now called "Junior High School" (Grades 7-10) while the upper specialized high school system is now called "Senior High School" (Grades 11 and 12). Secondary students used to sit for the National Secondary Achievement Test (NSAT), which was based on the American SAT, and was administered by the Department of Education. Like its primary school counterpart, NSAT was phased out after major reorganizations in the education department. Its successors, the National Career Assessment Examination (NCAE) and National Achievement Test (NAT) were administered to third- and fourth-year students respectively, before the implementation of the K-12 system. The National Career Assessment Examination (NCAE) is now being administered for Grade 9 and the National Achievement Test (NAT) is being administered at Grade 6, 10, and 12. Neither the NSAT nor NAT have been used as a basis for being offered admission to higher education institutions, partly because pupils sit them at almost the end of their secondary education. Instead, higher education institutions, both public and private, administer their own College Entrance Examinations (CEE) (subjects covered will depend on the institutions). Vocational colleges usually do not have entrance examinations, simply accepting the Form 138 record of studies from high school, and enrollment payment. Students graduating from the elementary level automatically enroll in junior high, which covers four years from grades 7 to 10. This level is now compulsory and free to all students attending public schools. There are two main types of high school: the general secondary school, which enroll more than 90 percent of all junior high school students, and the vocational secondary school. In addition, there are also science secondary schools for students who have demonstrated a particular gift in science at the primary level as well as special secondary schools and special curricular programs. Admission to public school is automatic for those who have completed six years of elementary school. Some private secondary schools have competitive entrance requirements based on an entrance examination. Entrance to science schools, art schools, and schools with special curricular programs is also by competitive examination sometimes including interviews, and auditions. The Department of Education specifies a compulsory curriculum for all junior high school students, public and private. There are five core subjects: Science, Mathematics, English, Filipino, and Araling Panlipunan (Social Studies). Other subjects in all levels of junior high school include MAPEH (a collective subject comprising Music, Art, Physical Education and Health), Values Education and Technology and Livelihood Education. In other public schools or private secondary schools offers specialized curricular programs for students with gifts and or talents as well as aptitude in fields of: sciences and mathematics, sports, the arts, journalism, foreign language, or technical-vocational education. These are under the DepEd with the latter in partnership with TESDA. These special programs for special schools are: Science, Technology, Engineering, and Mathematics Program (STEM, formerly called ESEP); Special Program in Sports (SPS); Special Program in the Arts (SPA); Special Program in Journalism (SPJ); Special Program in Foreign Language (SPFL); and Technical-Vocational-Livelihood Program (TVL). These programs offers comprehensive secondary education in a particular academic or career pathway field. Because of being career-pathway oriented, special and advanced subjects are offered in replace of TLE subject and sometimes includes even more time and subjects for specialized learning and training. In selective schools, various languages may be offered as electives like in a SPFL program, as well as other subjects such as computer programming and literary writing like in STEM schools or Laboratory High Schools. Chinese schools have language and cultural electives. International Schools offers electives or subjects like writing, culture, history, language, art, or a special subject unique to the school. Preparatory schools like technical vocational schools or schools with TVL Program usually add some business, entrepreneurship, and accountancy courses. Special science high schools like those of PSHS System (administered by DOST) and RSHS System (administered by DepEd) have biology, chemistry, and physics at every level and or exclusive and advanced science and math subjects as well as subjects in technology, pre-engineering, and research. These science schools are more exclusive and with higher standards compared to general high school's STEM Program. PSHS or RSHS students may transfer to a STEM program school but not the way around. PSHS students may also transfer to a RSHS and vice versa only for incoming sophomore year. Both PSHS and RSHS students must maintain an average grade especially in their advanced sciences and math subjects on a quarterly basis or else will lose the chance of continuing education in these schools, therefore, will make students transfer to a STEM Program school or a general high school. This systems makes sure the quality and exclusiveness of science high schools. In special government-run art school such as Philippine High School for the Arts, which is administered by the Cultural Center of the Philippines in coordination with Department of Education, and as well as the National Commission for Culture and the Arts offers a much specialized and exclusive curricular program than general high school's SPA Program. Like the PSHS and RSHS to STEM schools system, students from PHSA should maintain grades in their art field of specialization or will transfer to an SPA school or a general high school. But SPA students can enroll in PHSA only for incoming sophomores passing exclusive test, auditions, and interviews, and not from general high schools but from SPA school only. Both schools of Philippine Science High School System and the Philippine High School for the Arts are administered by government agencies apart from DepEd but still is in coordination with it. These schools offers scholarship for students with high aptitude and talents in science fields or the art fields granting those who passes rigorous and exclusive tests with many special benefits like free board and lodging, free books, a monthly stipend, and classes taught by experts, masters, and active practitioners of their respective fields among others. Formal technical and vocational education starts at secondary education, with a two-year curriculum, which grants access to vocational tertiary education. However, there is also non-formal technical and vocational education provided as alternative learning programs. Vocational schools offer a higher concentration of technical and vocational subjects in addition to the core academic subjects studied by students at general high schools. These schools tend to offer technical and vocational instruction in one of five main fields: agriculture, fisheries, trade-technical, home industry, and ‘non-traditional’ courses while offering a host of specializations. During the first two years, students study a general vocational area, from the five main fields mentioned. During the third and fourth years they specialize in a discipline or vocation within that area. Programs contain a mixture of theory and practice. Upon completion of Grade 10 of Junior High School, students can obtain Certificates of Competency (COC) or the vocationally oriented National Certificate Level I (NC I). After finishing a Technical-Vocational-Livelihood track in Grade 12 of Senior High School, a student may obtain a National Certificate Level II (NC II), provided he/she passes the competency-based assessment administered by the Technical Education and Skills Development Authority(TESDA). The new high school curriculum includes core classes and specialization classes based on student choice of specialization. Students may choose a specialization based on aptitude, interests, and school capacity. Classes or courses are divided into two: Core Curriculum Subjects and Track Subjects. There are eight learning areas under the core curriculum. These are Language, Humanities, Communication, Mathematics, Science, Social Science, Philosophy, and PE and Health. These will make up 15 core courses with the same contents and competencies but with allowed contextualization based on school's location despite of specializations of tracks and strands. Track subjects will be further divided into Applied or Contextualized Subjects and the Specialization Subjects. There would be 7 Applied Subjects with competencies common to tracks and strands or specializations but with different contents based on specialization, and there would be 9 Specialization Subjects with unique contents and competencies under a track or strand. All the subjects (core, applied and specialized) are having 80 hours per semester each, except for Physical Education and Health, having 20 hours per semester. And for the subjects under General Academics Strand (GAS), Humanities 1 and 2 will be chosen from the HUMSS track subjects 1 to 4, and for the Social Science 1 will be chosen from HUMSS track subjects 5 to 8. SHS will be offered free in public schools and there will be a voucher program in place for public junior high school completers as well as ESC beneficiaries of private high schools should they choose to take SHS in private institutions. This means that the burden of expenses for the additional two years need not be completely shouldered by parents. For their specialization classes, students choose from four tracks: Academic; Technical-Vocational-Livelihood; Sports; and the Arts and Design. Accountancy and Business Management (ABM) which will prepare students for college courses in the business-related careers such as accountancy, business management, office administration, finance, economics, marketing, sales, human resource management, business operations, entrepreneurship, etc. Humanities and Social Sciences (HUMSS) which will prepare students to college courses in the fields of humanities like language arts, literature, history, philosophy, religious studies, and the liberal arts as well as in the field of social sciences and applied social sciences like anthropology, economics, political science, psychology, sociology, criminology, geography, counseling, social work, journalism and communications, etc. Science and Technology, Engineering, and Mathematics (STEM) which will prepare students for college courses in the fields of natural and physical sciences, applied sciences, allied medicine, computer studies, architecture, engineering, mathematics, etc. The new Pre-Baccalaureate Maritime Strand which is an academic maritime field preparatory strand with pre-engineering courses lie pre-calculus, calculus, and physics as well as one chemistry and introductory maritime courses, preparing students who wishes to pursue higher education in a maritime-related field. The new field of TVL Maritime (a Technical-Vocational-Livelihood counterpart of the Pre-Baccalaureate Maritime of Academic Track). A mixture of specialization courses from these four fields can also be done, depending on the curricular program and offerings offered by schools who offers TVL track. Sports track will prepare students with sports science, sports-related, physical education-related, health-related, and movement-related courses which will let them explore and specialize in fields like sports fundamental coaching, student-athlete development, sports officiating and activity management, recreational and fitness or sports leadership. This will be with courses in safety and first aid, fitness testing and basic exercise programming, psychosocial aspects of sports and exercise, and human movement. Students will have an immersion or practicum in a sports, fitness, exercise, or recreation specialization of one will be in-campus practicum and one will be off-campus apprenticeship. This track will prepare students with careers in sports athletics, fitness, exercise, recreational leadership, sports event management, coaching, and physical therapy. Arts and Design Track will prepare student for the creative industries in various creative and artistic fields such as but not limited to: music, dance, creative writing and literature, visual arts, global media arts, broadcast arts, film and cinema, applied arts, architecture and design, theater, entertainment, etc. Students will be trained with lectures and immersions in arts appreciation and production and the performing arts. They will also learn and be prepared with physical and personal development which will help them with physical, personal, and health factors in the arts fields as an introduction to workplaces; integration of elements and principles of art which will deepen their understanding about art elements and principles and their applications; building cultural and national identity in arts which will help them appreciate cultural icons and traditional or indigenous materials, techniques, and practices in their art field. Students also will be immersed to an art field of their choice: music, theater, literary art, visual art, or media art under apprenticeship with practitioner/s of the field and will culminate showcasing their skills and talents in either a performing arts performance, a visual and media art exhibit, or a literary art production. The government projects some 1.2 to 1.6 million students will enter senior high school in the 2016-17 academic year. Senior High School "completes" basic education by making sure that the high school graduate is equipped for work, entrepreneurship, or higher education. This is a step up from the 10-year cycle where high school graduates still need further education (and expenses) to be ready for the world. There are 334 private schools with Senior High School permits beginning in SY 2014 or 2015. Last March 31, 2015, provisional permits have been issued to 1,122 private schools that will offer Senior High School in 2016. Senior High School will be offered free in public schools and there will be a voucher program in place for public junior high school completers as well as ESC beneficiaries of private high schools should they choose to take Senior High School in private institutions. This means that the burden of expenses for the additional two years need not be completely shouldered by parents. All grade 10 completers from a public Junior High School who wish to enroll in a private or non-DepEd Senior High School automatically get a voucher. All tertiary education matters are outside of the jurisdiction of DepEd, which is in charge of primary and secondary education, but is instead governed by the Commission on Higher Education (CHED). As of 2013, there are over 2,229 higher education institutions (HEI's) in the country which can be divided into public and private institutions. There are 656 public higher education institutions which account for 28.53% of all HEI's. While 1,643 private institutions account for 71.47% of all HEI's. Public HEI's are further divided into state universities and colleges (SUC's), local colleges and universities (LUC's), special HEI's, and government schools. State universities and colleges are administered and financed by the government as determined by the Philippine Congress. LUC's are established by the local government units that govern the area of the LUC. The local government establish these institutions through a process and number of ordinances and resolutions, and are also in charge of handling the financing of these schools. Special HEI's are institutions that offer courses and programs that are related to public service. Examples of these include the Philippine Military Academy (PMA), Philippine National Police Academy (PNPA), Development Academy of the Philippines (DAP), etc. These institutions are controlled and administered through the use of specific laws that were created for them. Finally, government schools are public secondary and post-secondary technical-vocational education institutions that offer higher education programs. Private HEI's are established, and governed by special provisions by a Corporation Code, and can be divided into sectarian and non-sectarian. Non-sectarian are characterized by being owned and operated by private entities that have no affiliation with religious organizations; while sectarian HEI's are non-profit institutions that are owned and operated by a religious organization. Of the 1,643 institutions, 79% are non-sectarian, and 21% are sectarian. According to the last CHED published statistics on its website, there were 7,766 foreign nationals studying in various higher education institutions in the Philippines as of 2011-2012. Koreans were the top foreign nationals studying in the country with 1,572. The rest were Iranian, Chinese, American and Indian. There are other types of schools, aside from the general public school, such as private schools, preparatory schools, international schools, laboratory high schools, and science high schools. Several foreign ethnic groups, including Chinese, British, Singaporeans, Americans, Koreans, and Japanese operate their own schools. Science high schools are special schools for the more intellectually promising students, with the objective of fostering the problem-solving approach of critical thinking. They are separate high schools and not merely special classes in regular secondary schools. As such, they have certain characteristics not found in regular high schools, although any private or public high school can aspire to meet these special minimum standards and be considered as science high schools. The Philippine Science High School System is a specialized public system that operates as an attached agency of the Philippine Department of Science and Technology. There are a total of nine regional campuses, with the main campus located in Quezon City. Students are admitted on a selective basis, based on the results of the PSHS System National Competitive Examination. As well as following the general secondary curriculum, there are advanced classes in science and mathematics. The PSHSS system offers an integrated junior high and senior high six-year curriculum. Students who successfully completed a minimum of four years of secondary education under the pre-2011 system were awarded a Diploma (Katibayan) and, in addition, the secondary school Certificate of Graduation (Katunayan) from the Department of Education. Students are also awarded a Permanent Record, or Form 137-A, listing all classes taken and grades earned. Under the new K-12 system, the permanent record will be issued after the completion of senior high school. While there has been recognized Islamic schools—i.e., Ibn Siena Integrated School (Marawi), Sarang Bangun LC (Zamboanga), and Southwestern Mindanao Islamic Institute (Jolo)—their Islamic studies curriculum varies. With the Department of Education-authorized SMC, the subject offering is uniform across these private madaris. The alternative learning systems in the Philippines caters to the needs of the following: elementary and secondary school dropouts, kids that are older than the normal age for a specific grade level (this may be a 12 year old in grade 4), unemployed adults that haven't finished their education degree, indigenous people, people with disabilities or are mentally challenged, and inmates. It is possible to have both informal and formal references for these alternative learning systems because these are apart from the formal teaching institutions. Although similarly to the formal teaching institutions, there will be a diagnostic test for everyone that will participate in order to gauge the level they are at in terms of the skills needed per grade level. If there are people that do not have the basic skills such as reading and writing there will be an additional program that will help them first learn the basics before taking the diagnostic test. There will be a specific number of hours that is required of the student in order for him/her to be able to finish the program. There will be a final assessment to test the comprehensive knowledge of the student. If the students passes he/she will be given a certificate that is signed by the secretary of the department of education allowing the student to apply for college degrees, work, formal training programs, and can re-enroll in elementary/secondary education in formal teaching institutions. There are other avenues of alternative learning in the Philippines such as the Radio-Based Instruction (RBI) Program. This is designed to give the lectures through a radio transmission making it easier for people to access wherever they are. The goal is for the listeners to receive the same amount of education that people that sit in classroom lectures. Non-formal technical and vocational education is assumed by institutions usually accredited and approved by TESDA: center-based programs, community-based programs and enterprise-based training, or the Alternative Learning System (ALS). The Institutions may be government operated, often by provincial government, or private. They may offer programs ranging in duration from a couple of weeks to two-year diploma courses. Programs can be technology courses like automotive technology, computer technology, and electronic technology; service courses such as caregiver, nursing aide, hotel and restaurant management; and trades courses such as electrician, plumber, welder, automotive mechanic, diesel mechanic, heavy vehicle operator & practical nursing. Upon graduating from most of these courses, students may take an examination from TESDA to obtain the relevant certificate or diploma. In the country, there are a number of people particularly kids that do not receive proper education from formal education institutions because of various reasons. These reasons usually pertain to financial problems. A public education system was first established - a system specifically patterned after the United States school system and further administered by the newly established Department of Instruction. Similar to the United States, the Philippines has had an extensive and extremely inclusive system of education including features such as higher education. The present Philippine educational system firstly covers six years of compulsory education (from grades 1 to 6), divided informally into two levels - both composed of three years. The first level is known as the Primary level and the second level is known as the Intermediate level. However, although the Philippine educational system has extensively been a model for other Southeast Asian countries, in recent years such a matter has no longer stood true, and such a system has been deteriorated - such a fact is especially evident and true in the country's more secluded poverty-stricken regions. Most of the Philippines faces several issues when it comes to the educational system. First of which, is the quality of education. In the year 2014, the National Achievement Test (NAT) and the National Career Assessment Examination (NCAE) results show that there had been a decline in the quality of Philippine education at the elementary and secondary levels. The students’ performance in both the 2014 NAT and NCAE were excessively below the target mean score. Having said this, the poor quality of the Philippine educational system is manifested in the comparison of completion rates between highly urbanized cities of Metro Manila, which is also happens to be not only the country's capital region but the largest metropolitan area in the Philippines and other places in the country such as Mindanao and Eastern Visayas. Although Manila is able to boast a primary school completion rate of approximately 100 percent, other areas of the nation, such as Eastern Visayas and Mindanao, hold primary school completion rate of only 30 percent or even less. This kind of statistic is no surprise to the education system in the Philippine context, students who hail from Philippine urban areas have the financial capacity to complete at the very least their primary school education. The second issue that the Philippine educational system faces is the budget for education. Although it has been mandated by the Philippine Constitution for the government to allocate the highest proportion of its government to education, the Philippines remains to have one of the lowest budget allocations to education among ASEAN countries. The third prevalent issue the Philippine educational system continuously encounters is the affordability of education (or lack thereof). A big disparity in educational achievements is evident across various social groups. Socioeconomically disadvantaged students otherwise known as students who are members of high and low-income poverty-stricken families have immensely higher drop-out rates in the elementary level. Additionally, most freshmen students at the tertiary level come from relatively well-off families. Lastly, there is a large proportion of mismatch, wherein there exists a massive proportion of mismatch between training and actual jobs. This stands to be a major issue at the tertiary level and it is furthermore the cause of the continuation of a substantial amount of educated yet unemployed or underemployed people. France Castro, the secretary of Alliance of Concerned Teachers (ACT), stated that there is a grave need to address the alarming number of out-of-school youth in the country. The Philippines overall has 1.4 million children who are out-of-school, according to UNESCO's data, and is additionally the only ASEAN country that is included in the top 5 countries with the highest number of out-of-school youth. In 2012, the Department of Education showed data of a 6.38% drop-out rate in primary school and a 7.82% drop-out rate in secondary school. Castro further stated that "the increasing number of out-of-school children is being caused by poverty. The increases in the price of oil, electricity, rice, water, and other basic commodities are further pushing the poor into dire poverty." Subsequently, as more families become poorer, the number of students enrolled in public schools increases, especially in the high school level. In 2013, the Department of Education estimated that there are 38, 503 elementary schools alongside 7,470 high schools. There is a large mismatch between educational training and actual jobs. This stands to be a major issue at the tertiary level and it is furthermore the cause of the continuation of a substantial amount of educated yet unemployed or underemployed people. According to Dean Salvador Belaro Jr., the Cornell-educated Congressman representing 1-Ang Edukasyon Party-list in the House of Representatives, the number of educated unemployed reaches around 600,000 per year. He refers to said condition as the "education gap". Brain drain is a persistent problem evident in the educational system of the Philippines due to the modern phenomenon of globalization, with the number of Overseas Filipino Workers (OFWs) who worked abroad at any time during the period April to September 2014 was estimated at 2.3 million. This ongoing mass immigration subsequently induces an unparalleled brain drain alongside grave economic implications. Additionally, Philippine society hitherto is footing the bill for the education of millions who successively spend their more productive years abroad. Thus, the already poor educational system of the Philippines indirectly subsidizes the opulent economies who host the OFWs. There exists a problematic and distinct social cleavage with regard to educational opportunities in the country. Most modern societies have encountered an equalizing effect on the subject of education. This aforementioned divide in the social system has made education become part of the institutional mechanism that creates a division between the poor and the rich. There are large-scale shortages of facilities across Philippine public schools - these include classrooms, teachers, desks and chairs, textbooks, and audio-video materials. According to 2003 Department of Education Undersecretary Juan Miguel Luz, reportedly over 17 million students are enrolled in Philippine public schools, and at an annual population growth rate of 2.3 per cent, about 1.7 million babies are born every year which means that in a few years time, more individuals will assert ownership over their share of the (limited) educational provisions. To sum it up, there are too many students and too little resources. Albeit the claims the government makes on increasing the allocated budget for education, there is a prevalent difficulty the public school system faces with regard to shortages. Furthermore, state universities and colleges gradually raise tuition so as to have a means of purchasing facilities, thus making tertiary education difficult to access or more often than not, inaccessible to the poor. However, it is worth taking note of what the Aquino administration has done in its five years of governance with regard to classroom-building - the number of classrooms built from 2005 to the first half of the year 2010 has tripled. Additionally, the number of classrooms that were put up from the year 2010 to February 2015 was recorded to be at 86,478, significantly exceeding the 17,305 classrooms that were built from 2005 to 2010 and adequate enough to counterbalance the 66,800 classroom deficit in the year 2010. In President Aquino's fourth state of the nation address (SONA), he spoke of the government's achievement of zero backlog in facilities such as classrooms, desks and chairs, and textbooks which has addressed the gap in the shortages of teachers, what with 56,085 new teachers for the 61, 510 teaching items in the year 2013. However, the data gathered by the Department of Education shows that during the opening of classes (June 2013), the shortages in classrooms was pegged at 19, 579, 60 million shortages when it came to textbooks, 2.5 million shortages with regard to chairs, and 80, 937 shortages of water and sanitation facilities. Furthermore, 770 schools in Metro Manila, Cebu, and Davao were considered overcrowded. The Department of Education also released data stating that 91% of the 61, 510 shortages in teachers was filled up alongside appointments (5, 425 to be specific) are being processed. There is a dispute with regard to the quality of education provided by the system. In the year 2014, the National Achievement Test (NAT) and the National Career Assessment Examination (NCAE) results show that there had been a decline in the quality of Philippine education at the elementary and secondary levels. The students’ performance in both the 2014 NAT and NCAE were excessively below the target mean score. Having said this, the poor quality of the Philippine educational system is manifested in the comparison of completion rates between highly urbanized city of Metro Manila, which is also happens to be not only the country's capital but the largest metropolitan area in the Philippines and other places in the country such as Mindanao and Eastern Visayas. Although Manila is able to boast a primary school completion rate of approximately 100 percent, other areas of the nation, such as Eastern Visayas and Mindanao, hold primary school completion rate of only 30 percent or even less. This kind of statistic is no surprise to the education system in the Philippine context, students who hail from Philippine urban areas have the financial capacity to complete at the very least their primary school education. The third issue involves the timing for requiring Grades 11 and 12. According to Sec. 4 of Republic Act No. 10533, "The enhanced basic education program encompasses at least one (1) year of kindergarten education, six (6) years of elementary education, and six (6) years of secondary education, in that sequence. Secondary education includes four (4) years of junior high school and two (2) years of senior high school education." However, according to Sec. 4 of Republic Act No. 10157, "Kindergarten education is hereby institutionalized as part of basic education and for school year 2011-2012 shall be implemented partially, and thereafter, it shall be made mandatory and compulsory for entrance to Grade 1." That means in order to follow the enhanced basic education program, students must take kindergarten before taking six years of elementary education, followed by six years of secondary education, which includes Grades 11 and 12. But since kindergarten became mandatory and implemented fully only in SY 2012-2013, then Grade 11 can only be required in SY 2023-2024. ^ Rey, Aika (December 19, 2017). "What's the share of gov't offices in the 2018 P3.8-T national budget?". Rappler. ^ Desiderio, Louella (31 December 2013). "Phl literacy rate improves to 97.5% – NSO". www.philstar.com. Philippine Star. Retrieved 14 August 2017. ^ Geronimo, Jee (June 5, 2017). "22.9M students return to public schools nationwide". Rappler. ^ "The Educational Attainment of the Household Population (Results from the 2010 Census)". psa.gov.ph. Philippine Statistics Authority. 10 January 2013. Retrieved 14 August 2017. ^ a b Francia, Luis (2010). A History of the Philippines: from indios bravos to filipinos. New York: The Overlook Press. pp. 40–44. ISBN 978-1-59020-285-2. ^ Hernandez Kahayon, Alicia; Limdico, Magdalena; Santiago, E M (1989). Panitikang Filipino: kasaysayan at pag-unlad: pangkolehiyo. Metro Manila: National Book Store Publishing Inc. pp. 32–33. ISBN 978-9-71084-374-9. ^ P. N. Abinales; Donna J. Amoroso (2005). State and Society in the Philippines. Rowman & Littlefield. pp. 92–93. ISBN 978-0-7425-1024-1. ^ a b c d Estioko SVD, Leonardo (1994). History of Education: A Filipino Perspective. LOGOS Publications, Inc. pp. 163–200. ^ Arcilla, José S. (1998). An Introduction to Philippine History. Ateneo University Press. p. 50. ISBN 978-971-550-261-0. ^ Damon L. Woods (2006). The Philippines: A Global Studies Handbook. ABC-CLIO. p. 140. ISBN 978-1-85109-675-6. ^ Leroy James A. (August 2009). The Americans in the Philippines. BiblioBazaar, LLC. pp. 36. ISBN 978-1-113-53176-6. ^ a b Country Studies: Philippine Education. Retrieved January 24, 2009. ^ Schumacher, John N. (1997). The Propaganda Movement, 1880-1895: The Creation of a Filipino Consciousness, the Making of Revolution. Ateneo University Press. pp. 23. ISBN 978-971-550-209-2. ^ a b c d e f g Dalmacio, Martin (1980). A Century of Education in the Philippines, 1861-1961. Manila: Philippine Historical Association. pp. 115–221. ^ a b "Department of Education". ^ "Philippine Constitution". Official Gazette. Government of the Philippines. ^ "Press Release: Aquino Unveils Agenda for Philippine Education System". Senate of the Philippines. Retrieved 15 June 2016. ^ "Briefer on the Enhanced K to 12 Basic Education Program". Official Gazette of the Philippines. Retrieved 15 June 2016. ^ Secondary Education Regional Information Base: Country Profile – Philippines. Bangkok: UNESCO Bangkok, 2009. 20 pp. ^ "The K to 12 Basic Education Program - GOVPH". ^ "K to 12 Basic Education Program Frequently Asked Questions" (PDF). Department of Education. 25 November 2011. Archived from the original (PDF) on 2012-06-11. Retrieved 28 April 2012. ^ "Republic Act No. 10931 : AN ACT PROMOTING UNIVERSAL ACCESS TO QUALITY TERTIARY EDUCATION BY PROVIDING FOR FREE TUITION AND OTHER SCHOOL FEES IN STATE UNIVERSITIES AND COLLEGES, LOCAL UNIVERSITIES AND COLLEGES AND STATE-RUN TECHNICAL-VOCATIONAL INSTITUTIONS, ESTABLISHING THE TERTIARY EDUCATION SUBSIDY AND STUDENT LOAN PROGRAM, STRENGTHENING THE UNIFIED STUDENT FINANCIAL ASSISTANCE SYSTEM FOR TERTIARY EDUCATION, AND APPROPRIATING FUNDS THEREFOR". Official Gazette. Government of the Philippines. August 3, 2017. ^ "informal, non-formal and formal education - some different approaches". www.infed.org. Retrieved 2016-05-11. ^ a b c d e f g "Department of Education. "The K to 12 Basic Education Program."". Archived from the original on July 25, 2014. ^ FACT SHEET BASIC EDUCATION STATISTICS (2005-2010), (archived from the original Archived May 11, 2011, at the Wayback Machine on 2011-05-11), deped.gov.ph. ^ a b c "Education in the Philippines - WENR". WENR. 2015-07-08. Retrieved 2016-05-11. ^ "Academic Track - Department of Education". ^ "Technology and Livelihood Education (TLE) and Technical-Vocational-Livelihood (TVL) Track - Department of Education". ^ "Sports Track - Department of Education". ^ "Arts and Design Track - Department of Education". ^ a b c "Higher Education Institutions". The Official Website of Commission on Higher Education. Retrieved 2016-05-11. ^ "Foreign Students". Ched.gov.ph. Archived from the original on February 15, 2014. Retrieved 2010-07-29. ^ "DO 69, s. 1993 - Science High Schools". Department of Education. ^ "TVET in the Philippines". UNESCO-UNEVOC. 2014. Retrieved 4 August 2014. ^ "Education gaps hampering AEC labor integration - The Manila Times Online". www.manilatimes.net. Retrieved 2018-05-31. ^ "Poverty, hunger prevent Filipino kids from getting basic education". GMA News Online. Retrieved 2018-05-31. ^ a b Anne Umil, "Shortages, Lack Of Budget Still Afflict Public School System – Bulatlat", Bulatlat.Com, last modified 2013, accessed May 10, 2016. ^ "30 bills on school reforms UP". Manila Standard. Retrieved 2018-05-31. ^ Ronald Meinardus, "The Crisis Of Public Education In The Philippines | Liberal Opinion", Fnf.Org.Ph, last modified 2016, accessed May 10, 2016. ^ "Overseas Filipinos | Philippine Statistics Authority", Psa.Gov.Ph, last modified 2016, accessed May 10, 2016. ^ "Republic Act No. 10533 | GOVPH". Official Gazette of the Republic of the Philippines. Retrieved 2017-09-17. ^ "Republic Act No. 10157 | GOVPH". Official Gazette of the Republic of the Philippines. Retrieved 2017-09-17. Florido, Alethea M. (2006). Education Profile of the Philippines and Best Practices in Filipino Schools and Classrooms (PDF) (Report). University of North Carolina.